Happy Holidays everyone! The UFC is giving us a great present this year by treating us with one of the biggest matchups of all time in the UFC. Two absolute monsters will face off in this *FRIDAY’S* Main Event. Brock Lesnar and Alistair “The Demolition Man” Overeem will go toe to toe in an epic Number One Contender bout in the Heavyweight division, emphasis on heavy! Overshadowed by the HUGE bout is a high octane matchup between Nate Diaz and Donald “Cowboy” Cerrone. Both fighters will be looking to land “punches in bunches” as soon as the bell rings. A bit of bad blood between the two lightweights will also add to this already explosive matchup. On to the preview! Gustaffson is a rising star in the Light Heavyweight division. His heavy hands and impressive record have his name slowly gaining recognition as fans across the globe are starting to notice his prowess in the cage. Matyushenko is a true professional, he fully embraces the role of “Gatekeeper” in the Light Heavyweight division and always looks to put on a good show for the fans. 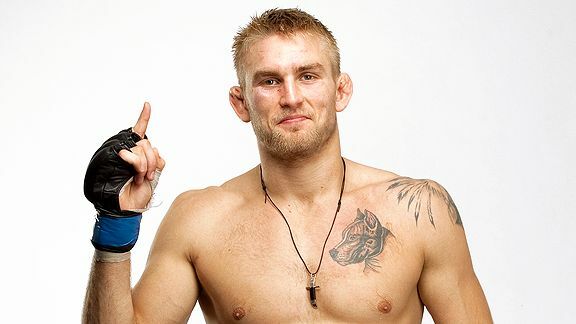 Matyushenko is a great test for the 24-year-old Gustafsson because both fighters will be looking to stand and bang until the other is asleep on the mat. Prediction: Gustaffsson is coming off an impressive TKO victory over Matt Hamill and I expect him to continue his winning ways on Friday. Expect Gustaffson’s star to keep growing brighter. Gustaffson by KO. 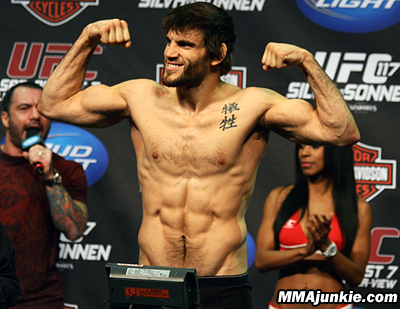 On Friday, Jon Fitch will continue his campaign for another title shot in the welterweight divison. Fitch is coming off a shoulder injury that his kept him away from the cage since his draw with BJ Penn at UFC 127. Fitch has been looking to get back into title contention ever since his five round loss to GSP at UFC 87 in 2008. Since then, Fitch has gone undefeated (5-0-1) in the division. It is often asked in MMA circles why the former Boilermaker’s name hasn’t been tossed around for a rematch with the Canadian Champ; many believe it is because Fitch was utterly dominated by St.-Pierre in 2008, while others think it is because Fitch has a somewhat “boring” style because of his strong wrestling background. None of that will matter though if Fitch does not get through his next opponent on Friday, the wily Jonny Hendricks. Hendricks is another collegiate wrestler who has been impressive in the Octagon since joining the organization in 2009. Hendricks has surprising power in his hands for being such a strong wrestler, as he has gained 6 of his 11 wins by KO. Prediction: I hope that Fitch is fully recovered from his shoulder injury when he enters the cage on Friday. With a strong training camp, I believe Fitch should be the favorite here. Though, it does seem as though Fitch has spent a SERIOUS amount of time playing Xbox in the lead up to this fight, you can read about his adventures in Skyrim here. With a victory, I think Fitch deserves a shot at whoever wins the Interim Welterweight title when Nick Diaz and Carlos Condit face off at UFC 143. Fitch by Decision. This lightweight bout could easily steal the show from the big boys on Friday night. These fighters put the pedal to the metal every time they enter the cage. Both have high level stand up games, and incredible skill on the ground. Wherever this fight ends up, standing or on the mat, both fighters have the tools to counter the other. Diaz is coming off a dominating submission victory over Takanori Gomi. That bout at UFC 135 marked Diaz’s return to the lightweight division after a lackluster venture in the welterweight bracket. Diaz looked better than ever against Gomi and ready to take on all comers at 155. “Cowboy” Cerrone is always a threat to earn end-of-the-night honors. He has six “Fight of the Night” honors to his name; therefore, any time he enters the cage you can expect a bout that gets you out of your seat. Cerrone is on a six fight win streak spanning from the WEC to the UFC. Prediction: Diaz believes he is, “better than (Cerrone) everywhere”. Diaz is extremely talented, but I believe he may be underestimating the Cowboy. Cerrone has fought six times in the last fifteen months. He has won every fight. That means he has remained relatively unscathed in the cage and dominated his opponents. 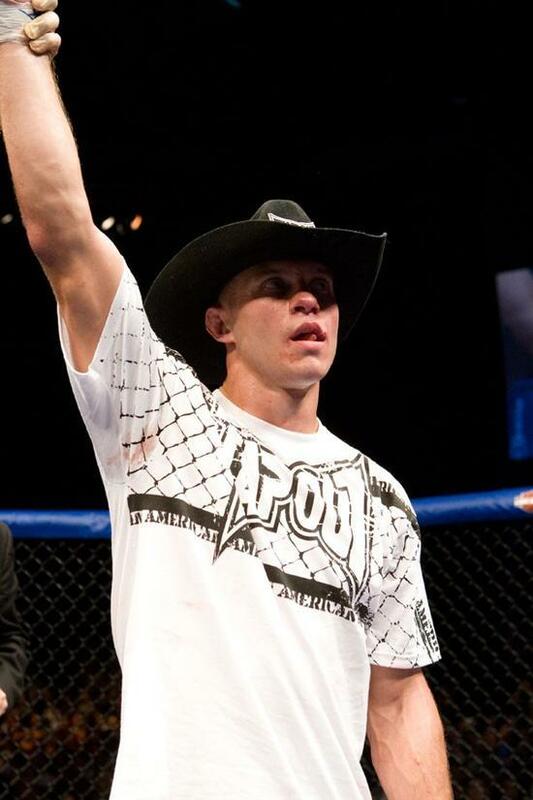 Cerrone had a great year in 2011, and in 2012 I can see him working his way to a lightweight title shot. It all begins with a win on Friday over Nate Diaz. Cerrone by Decision. Now that those are out of the way… I can get on to previewing literally one of the biggest fights in UFC history. As the fight poster proclaims, over 520 pounds of fighter will be in the cage on Friday. This is no David versus Goliath match-up; this is straight up Goliath versus Goliath. I am sure our friend Joe Rogan will remind us on Friday, but I have to say this is a true style versus style match-up. Lesnar is a wrestler to the core, and Overeem is one of the greatest strikers the sport has ever seen. It is simple; if Lesnar fails to take The ‘Reem down, it will be a longgg night for the former WWE superstar. Brock is entering the cage for the first time since losing his belt to Cain Velasquez in October of 2010. Since then Brock has had another fight on his hands, he had a serious case of Diverticulitis that kept him away from the gym for an extended period of time. After successful surgery, Lesnar returned to the gym in mid-August in order to prepare for another title run. I expect Brock to show up on Friday in spectacular shape. He has always taken his training seriously, and he knows that his superior athleticism and size are one of his major advantages in the ring. Overeem’s training style and mentality contrast to that of Lesnar’s. Overeem is another one of those mythical MMA superstars that seemingly travels the world and just looks to beat people up, no matter the organization, no matter the competition level. Whether he is fighting high-level MMA or Kickboxing Ubereem finishes opponents. Of his 35 wins, 2… I repeat 2 have gone to decision. That is an incredible finish percentage (maybe GSP should take note…) Though, due to a close family member being ill, Overeem’s training camp has not been as focused as he would have liked, but Overeem is dismissive of any distractions taking away from his performance against Lesnar. Even without a fully focused camp, I think Overeem holds the advantage over Brock. The size advantage that Brock usually holds over his opponents still exists with Overeem, but is not as drastic as it was with fighters like Randy Couture or a 2009 version of Frank Mir. Brock is not a striker, nor does he try to be. He simply does not like to get hit. Carwin and Velasquez both showed that when you hit Brock with a solid shot, he can crumble like a cookie. 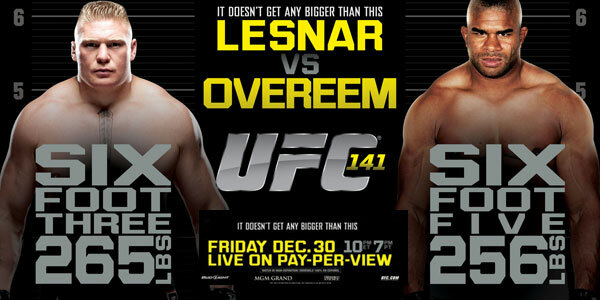 We all know that Overeem can, and will, hit Brock in the face with his hands, legs, and knees. Even if Brock controls Alistair on the cage and on the ground, Overeem’s striking is on such a level that he will only need one shot to stun and shake Brock. Once that shot hits and The ‘Reem breaks through Brock’s defense, I would look for Overeem to take charge and try to finish the fight. Prediction: Overeem has guaranteed a second round KO. I feel as though I have to agree with him. 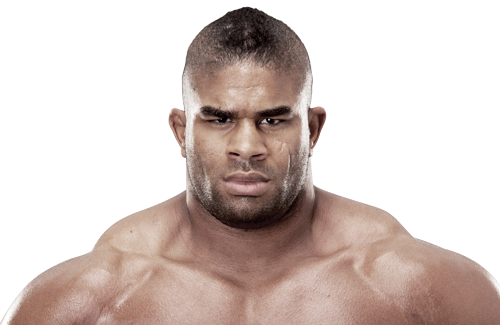 Brock is a great athlete, a great star for the UFC, but I do not trust his chin against such an accomplished striker as Overeem. Overeem’s camp distractions do not seem as though they will totally derail The Demolition Man. He has stated that he will still enter the Octagon and defeat Brock, and I believe him. Overeem by KO. Remember the fights are on Friday this week and return to the old 10 PM timeslot. Who do you think wins the BIG match up? Let us know in the comment section. Enjoy the fights! This entry was posted in Commentary, MMA and tagged Alistair Overeem, Brock Lesnar, Donald Cerrone, Jon Fitch, Nate Diaz, UFC 141, Ultimate Fighting Championship. Bookmark the permalink.